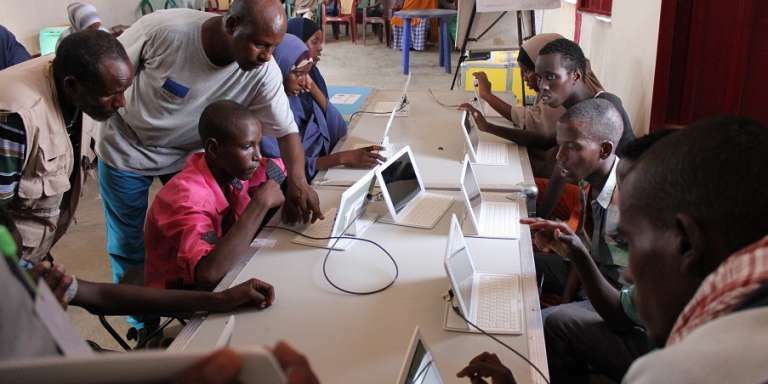 Libraries Without Borders has implemented two Ideas Box in the Dollo Ado region of Ethiopia for Somalian refugees. Over 200,000 somalian refugees have fled their country since the 1990s because of the food crisis and the conflict fueled by the Al Shabaab armed group which considerably prevents food aid from being distributed. The refugees are mainly families of nomadic herders and farmers from the districts of Gedo, Bay and Bakool. Ethiopian camps on the Somali border, in the region of Dollo Ado, now host more than 140,000 refugees, a number that is constantly growing. In December 2015, Libraries Without Borders and Save the Children deployed two Ideas Box in two Somali refugee camps, Malkadida and Bokolmanyo, in the Dollo Ado region in Ethiopia, close to the border with Somalia. The two Ideas Box are destined to promote children’s rights in particular, through access to quality education as well as safe espaces for reading, exchanging and participating in activities. New activities are being developed in 2016 for adults, including literacy workshops. Cultural activities will also bring together refugee and host populations to strengthen inter-community ties.